Why Choose NovaLash Lash Extensions in Princeton New Jersey? What are NovaLash extensions in Princeton NJ? What’s the longevity of NovaLash extensions? Provided they are properly applied, NovaLash extensions will not hurt or damage natural eyelashes. The application process actually allows natural lashes to flourish while adhered to the extensions. The application of a single extension to a single lash ensures that natural growth continues uninterrupted. What kind of daily care is required? In order to maximize the lifespan of NovaLash extensions, once-daily application of conditioner, specifically NovaLash’s nighttime conditioning/cleansing pads, is necessary. This keeps lashes lush and flexible with the added benefit of removing any dirt or makeup present on the lash. Finally, just like you should care for your regular hair, using a lash brush to comb the lash extensions once daily will help them remain attached for a longer period of time. They make efficient use of your valuable time. On average, an initial application appointment is finished in slightly more than an hour. They won’t weigh you down. The fiber that the eyelashes are made of, along with the adhesive itself, will not feel heavy on your face. There’s no pain, with lots of gain. A lash expert will apply each lash gently, one by one, to single eyelashes. The skilled lash expert will cause little if any discomfort and definitely absolutely no pain. They’re fiscally responsible for your personal budget. Since NovaLash lash extensions last for four weeks without additional applications, you’ll save money on mascara. Compared to Latisse, they’re extremely low maintenance. Lattise requires meticulous, daily application, while NovaLash only requires monthly application with minimal daily maintenance. And while Latisse sometimes takes months for observation of a demonstrable difference in appearance, NovaLash extensions make an immediate and dramatic difference. You’ll always wake up looking beautiful, with less makeup on to begin with. You can take them out at any time. 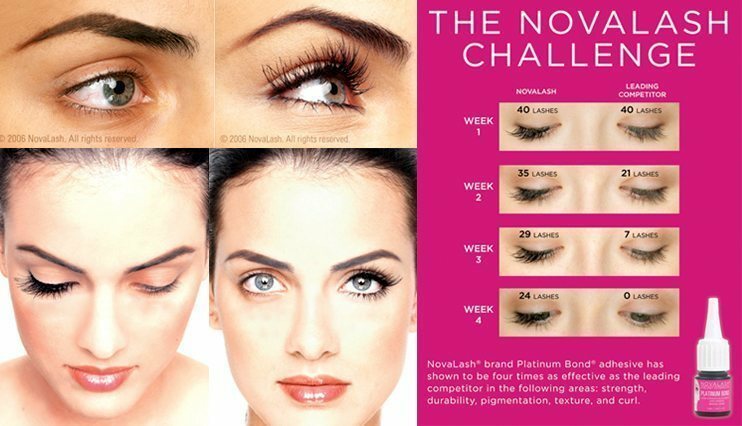 NovaLash extensions can be tailored to any color of lash, making anyone’s eyes naturally glow. The eyes are a window to the soul, so they’re the most important part of your appearance. Beautiful, dramatically defined eyes will minimize any other flaw.